I was born in Edinburgh in 1982 and grew up on the outskirts of the city in a little mining village called Winchburgh, with my Mum, stepdad, my little brother, Fraser and our twin sisters, Abbie and Sophie. I trained as a fabricator/Welder and continued in the trade up until 2010. In 2005, I travelled to Australia on a one year working holiday visa and fell in love with the place. I did the back-packing thing, explored, met new people and did jobs I’d never done before. It was during this time I worked in a couple of commercial kitchens washing dishes and being the run-around. I loved the pressure and busyness of it all. At the time, I was 23 and had never cooked anything before, it fascinated me. I watched and asked questions and started getting involved in prep jobs, most of them very unglamorous! But I loved it. I worked in a Spanish restaurant in Broadbeach, QLD where I met my now wife of 7 years, Angelique. After my year in Australia, I returned to Scotland and immediately set myself the goal of moving back to Australia permanently. I went back to welding, saved and waited 2 years for my residency to be granted. I returned in 2009 and made my new home on the Gold Coast. I continued welding but became unhappy with what I was doing and decided I needed to change career. I’d fallen in love with cooking and decided I would quit my highly skilled, well-paid job and do my cheffing apprenticeship. I did my apprenticeship at The Star Casino (Jupiter’s at the time), graduated and worked there as a commis Chef up until 2015. 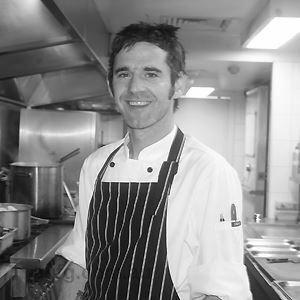 I came to Peppers Salt Resort & Spa at Kingscliff as a Chef de Partie in the banquets team, looking after conferencing and weddings, before being promoted to Senior Chef de Partie after 6 months. It was during that time my wife gave birth to our beautiful twins River and Bonnie-Rose. 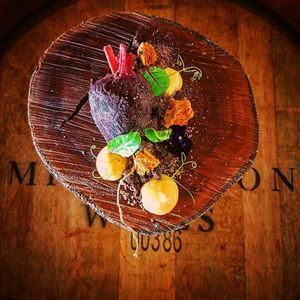 When the Chef de Cuisine of Season Restaurant position became available I was delighted to be given the opportunity, my first Head Chef job in a well-established place, with a good reputation and high standard, it was daunting yet very exciting! My style is fairly simple, flavour combinations that work with a few twists here and there. It’s also definitely nostalgic, a lot of the food/flavours I use remind me of my family and my childhood growing up with a Mum who hated cooking! Star anise, cardamom and apples. There are so many great Chefs it’s hard to choose; I love the style of many British Chefs. No two days are the same; it’s creative, hardworking, mentally challenging and fun. Probably the chocolate and beetroot brownie, with mandarin curd, honey and coriander (pictured). Scampi Tortellini: butter poached bug tail, bisque and lemon pangritata.